Such is the modern conditioning inherent in the news cycle that assumptions were immediate. A terror attack had taken place on a public gathering at the Route 91 Harvest Festival in Las Vegas. It was, as the case had been in the Bataclan shootings in Paris on 13 November 2015, a matter of inflicting mass damage in an enclosed space filled with revellers. The toll proved terrifying. The shooter, from his room on the 32nd floor of the Mandalay Bay Hotel, had inflicted 500 casualties, with 59 fatalities. (This number is bound to rise.) When the death toll passed 49, the efforts of Stephen Paddock of Mesquite, Nevada had shaded those of Omar Mateen at the Orlando Pulse night club last year. It was cold comfort to see that the attack was a local affair, not of official, internationally directed terrorism, but a mass shooting in its traditionally violent form. The behaviour of the shooter could not be explained as an act of anti-American delight, an instance of affirmation to a foreign ideology or code. There was no call of smug delight surging its way through social media from ISIS, an ecstatic assumption of responsibility. Paddock had seemingly worked alone, fastidiously assessing the situation, stockpiling arms in his room, and waiting for the moment when the crowd would be most concentrated. President Donald Trump also avoided the term. Terrorism has its loaded associations, a distinct demonology. To suggest that a US citizen might be a terrorist hardly accords with the project of Making America Great Again. Paddock was not a Muslim, which would have been a useful alibi for the restrictive policy on arrivals from specific Islamic countries. "This was a side of the United States that has spoken for generations: the man with the gun is king, if only for a brief and spectacularly bloody period of time." It follows that there are no such things as American terrorists, since Americans do not commit acts of terror. Such tormented logic explains Trump's assiduous references to 'senseless murder' and an 'act of pure evil'. The question of toll and cost remain marked but unanswered. In Trump's America, it has become fashionable to vent the spleen, to lash out at the unmentioned, to malign without distinction. The forgotten shall speak; the ignored shall be recognised again. But this was a side of the United States that has spoken for generations: the man with the gun is king, if only for a brief and spectacularly bloody period of time. The response tends to be 'cyclical', eventually normalising the unspeakable. It starts with searing grief, followed by a debate about banning assault weapons or encouraging the arming of even more Americans; it moves on to mental debility and the 'good guys vs bad guys'. Then come the mumblings on policy, where inertia sets in. Discuss options, draft them, but never pass them. In terms of a durable legacy from the legislatures, change will be scant. There will be prayers for loved ones, plentiful work for the counsellors, and stump positions for politicians. Under the Obama administration, changes to gun control were cosmetic and even frustrated at a time when the Democrats had a majority in the Senate. Currently before the House of Representatives is the Sportsmen Heritage and Recreational Act which actually lessens restrictions. Much as I despise Trump, I don't think we can blame him for this atrocity. Rather both Trump and the havoc caused by guns and gun owners in the US are symptoms and natural outcomes of the violence that is endemic in US culture and, I fear, the undue focus on individualism rather than community. I appreciate reading Eureka and seeing perspective of people from across our globe. You know much more about us (sadly) than most Americans (including me) know about you. I have not digested all you wrote. I will defend the position of the authorities of not answering if something is terrorism or not until the FACTS are known. It is not possible to triage 500 people and process a murder scene like this in minutes. I do not know if you can imagine the pain and challenges faced by first responders and medical personnel who are called to handle a situation that no one can ever be properly prepared for. Here in Florida we have been impacted by recent hurricanes in FL/Texas/Caribbean/Puerto Rico. Every day we wake up trying to contribute support to those suffering and there is a new crisis daily it seems. It has been very difficult. Thank you. Shaun King writes, “Whiteness, somehow, protects men from being labelled terrorists.” His article can be accessed through the provided hyperlink. It does not refer to Timothy McVeigh or the Tsarnaev brothers. All three, white, are described by the US authorities to be terrorists. Stop the automatic guns, they are only needed for military purposes. A fundamental problem in the USA is that rich lobby groups fronting for nasty industries openly "bye" politicians. In this case/issue it is the NRA, but Big Tobacco, Big Sugar, Big Pharma, etc etc are all doing it. The election-time PACs front for rich ideologues. This represents a failure of Democracy which is killing the USA from the inside. Australia is by no means immune and this includes much "green" anti-development money from the US, and Chinese government front organisations. Constant vigilance and strict anti-corruption, political foreign interference and transparency laws are vital. I agree with Arie Strobel. It's not the time (either) for the police to make a judgement on whether this was an act of domestic terrorism. Surely there is an accepted definition of 'terrorism' and surely it's connected with the intention of the perpetrator? If Paddock proves to have been making a point against Americans, or against country music lovers, or against party goers or any large group, it could be terrorism. If his deed was expressive of his own internal darkness, anger and grief, with no point to be made, surely that's not terrorism? It may be despair and madness, but it's not terrorism. The police chief was right - they have to discover his motivation. I was chastened to read somewhere that this was not a mass shooting with the largest number of casualties so far - this "honour" is still held by the massacre of indigenous people at Wounded Knee. GM, I agree that Trump and this hideous event are both symptoms of a culture of guns and individualism. I wonder why the 4th AMENDMENT cannot be amended further to bring about some firearm controls. Did anyone else feel a little unsettled about the group of pop artists who held a tribute concert 2 or 3 days after the massacre? No song could possibly express the shock and trauma and grief. Serious discussion on how this is allowed to keep happening would be a better way to respect the victims. There will be no gun law reform in the US - the gun lobby is too rich, the politicians too cowardly, the "gun culture" too embedded. And let's not forget we have our own equivalent of the NRA here in Australia - the Fishers, Shooters & Farmers Party would repeal Australia's strict gun laws if it could, allowing the sale of semiautomatic and automatic weapons once again - the kind of weapons used to murder the innocents of Las Vegas. Also, I've found myself grappling with why there's an obsession with the mass-murder's motives? 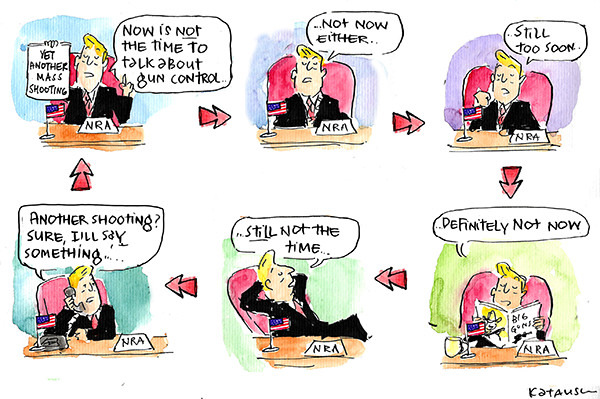 It seems like a convenient way to deflect responsibility from the real issue - gun control. There will always be disturbed, sociopathic/psychopathic people living amongst us, and trying to psychoanalysis all of them and second-guess what they might or might not do is ludicrous.